VICTORIA, B.C. 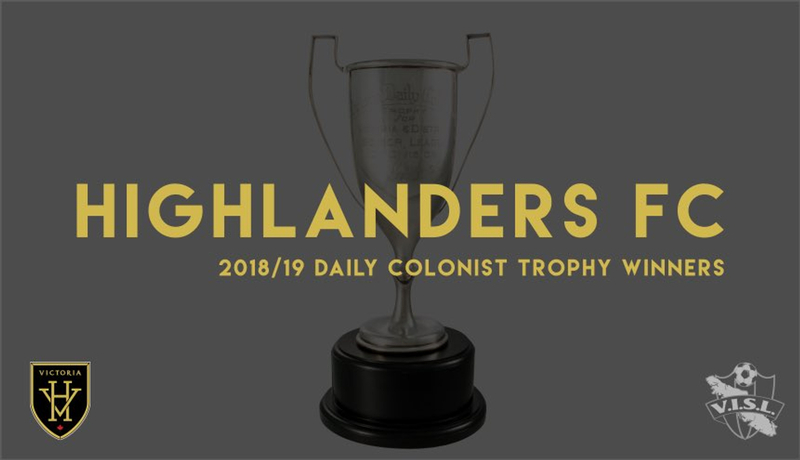 – Victoria Highlanders FC U19’s captured the 2018-19 Vancouver Island Soccer League (VISL) Daily Colonist Trophy by clinching the VISL Division 2 Championship on Saturday night. The U19 team finished the year with a 11-5-2 record on their way to a 38-point campaign. Going into the season, the addition of a VISL club created opportunities for players to develop their skills on a year-round basis. With the same players having a chance to compete for a spot on the Highlanders’ USL League Two first team and Pacific Coast Soccer League reserve team for the summer months. While it was a very successful inaugural season for the Highlanders FC U19 program, the squad still faced adversity and challenges along the way. Playing solid tactically and coming together as a team helped push them in the right direction in regard to their development. Highlanders FC U19 were led by a potent offence that scored a division-high 50 goals. Leading the way in the goal department were Mahdi Hammoud, Noah Lechelt, and James Gray. 16-year-old Hammoud converted a league-leading 19 goals on the season, which topped all divisions in the VISL. Being such a young roster at its core, the U19 squad’s impressive run in both the VISL Division 1 (in partnership with Westcastle FC) and Division 2 did not go unnoticed by the Highlanders FC front office. Well done on an incredible 2019 season, lads!